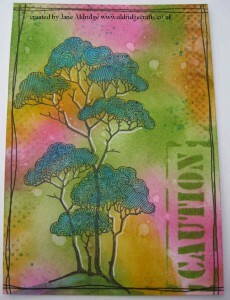 Another swooshy background again today that has been created with the Distress Paints. If you work with wet card and spritz water into the paint on your mat, you can get some beautiful swooshy blended backgrounds. Love this little chap! 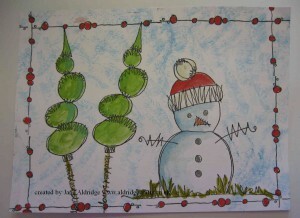 This piece has been done with JOFY02 Snowman PaperArtsy Stamp set. I started this piece by stamping out all my elements as I wanted to know where the snowman would be so I could work the background colour around him. Some projects go perfectly to plan. Some projects don’t! 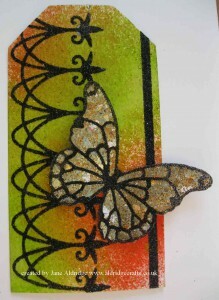 I had an idea in my mind to make a glittered delicate acetate butterfly. I used Stix2 Double Sided Tape Sticky Sheets and cut it just larger than my die, and a piece of Stix2 Acetate to the same size. 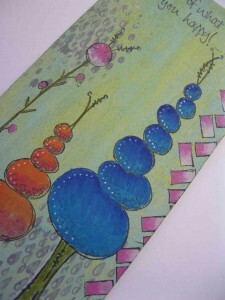 These wooden door hanger blanks are great to decorate. 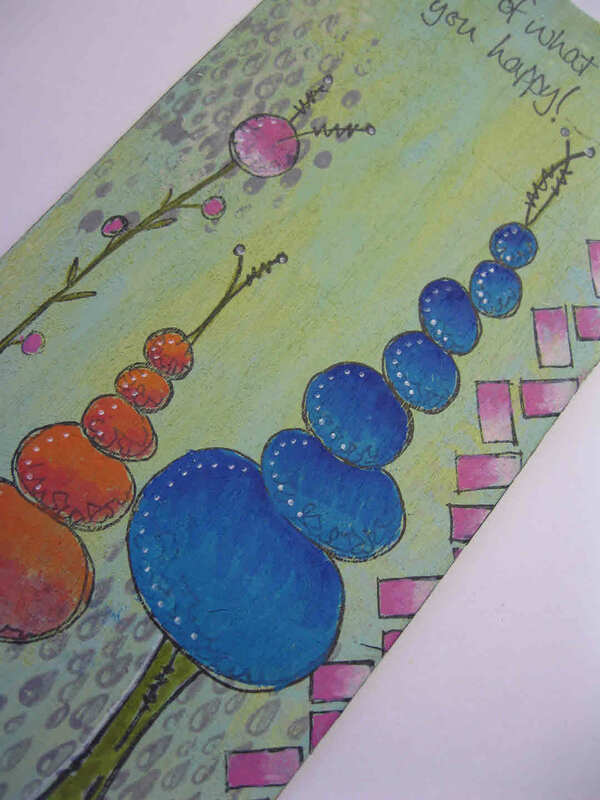 They are easy to paint and stamp and you get a good size surface area to put your design on…. and they are only £1.25 each – bargain! 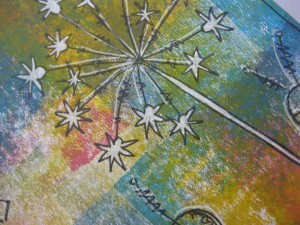 I’ve painted it with a mixture of acrylic paints – Cosmic Shimmer and Distress Paint. Lots of Chocolate Baroque stamps on this little piece of artwork. 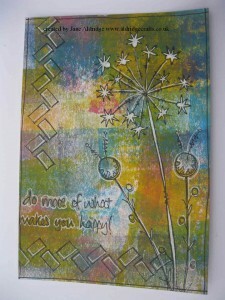 The background has been created using Distress Ink Pads applied with Cut n Dry Foam. 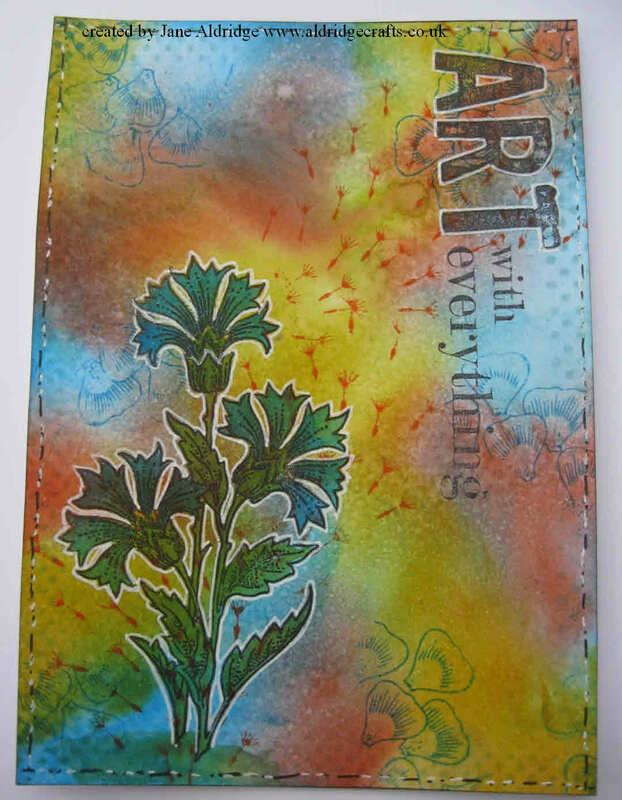 The stamps I’ve used are all Chocolate Baroque – Cornflower, Artistic Affirmations and the Seasonal Fragments set (perfect for background texture). I’ve also used a mask in the background to add some additional detail and then of course, my favourite white gel pen to make the cornflower pop out from the background. PaperArtsy with a bit more of a grungy feel today. 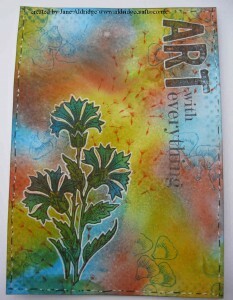 The background is Distress paint applied with a Brayer. I’ve kept the top layer very simple as there was so much colour on the background I felt more on top would make the image get lost in the background. Therefore I have just used white gel pen to lift the flowers into the foreground. 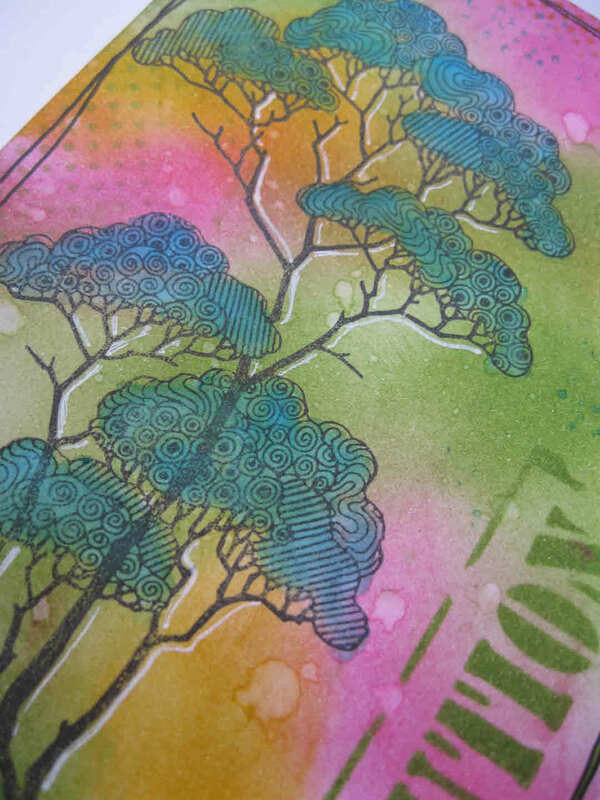 Always nice to use a set of stamps in different ways! This has been created using the JOFY Topiary style set. The greeting has been stamped in two stages – converting a long stamp to fit into a rectangle box. 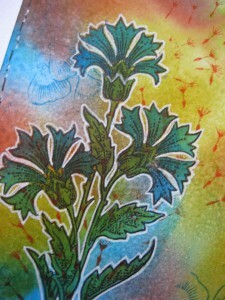 This piece was created as part of the workshop at the last Inky Addicts Club. We focussed on using Distress Ink Pads with Chocolate Baroque stamps. 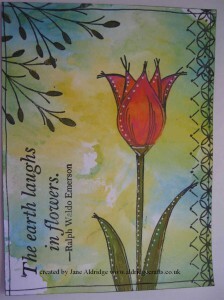 The background is created by applying Distress Ink with Cut n Dry foam. I’ve added on some stencil detail too. 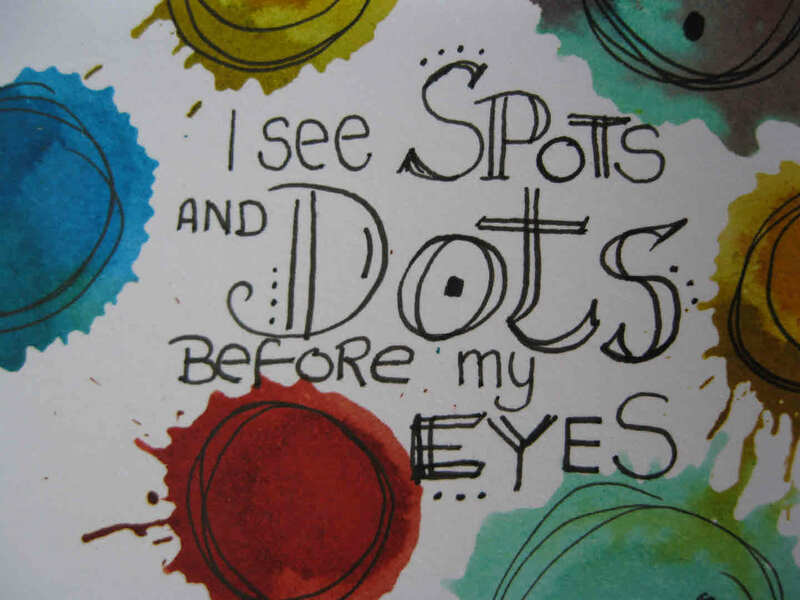 If you would like to come and join us at the next Inky Addicts Club – it’s open to any level crafter who likes to play with inks, paints and stamps. Our next club is on Sunday 9th August, 10-3pm at Garnier Hall in Eccles. Reservations for seats are now being taken. 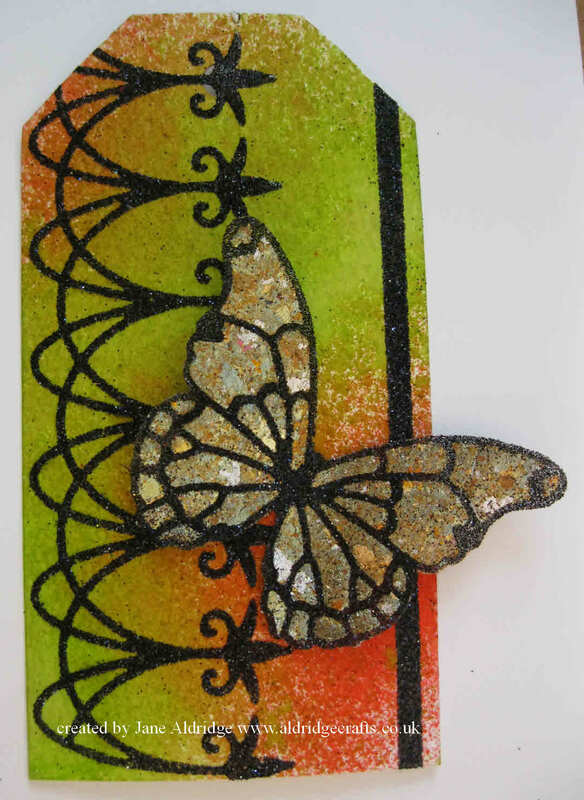 It costs £20 for the day (bring your own lunch) and we have a mini workshop – this month its Distress Paints with PaperArtsy stamps. You then spend the remainder of the day crafting on your own projects, or playing with the workshop supplies. I also take a mini shop with me too, so its an ideal opportunity if you can’t get to the shop to stock up on some goodies. Just call or email to reserve your seat! I love this fun technique. 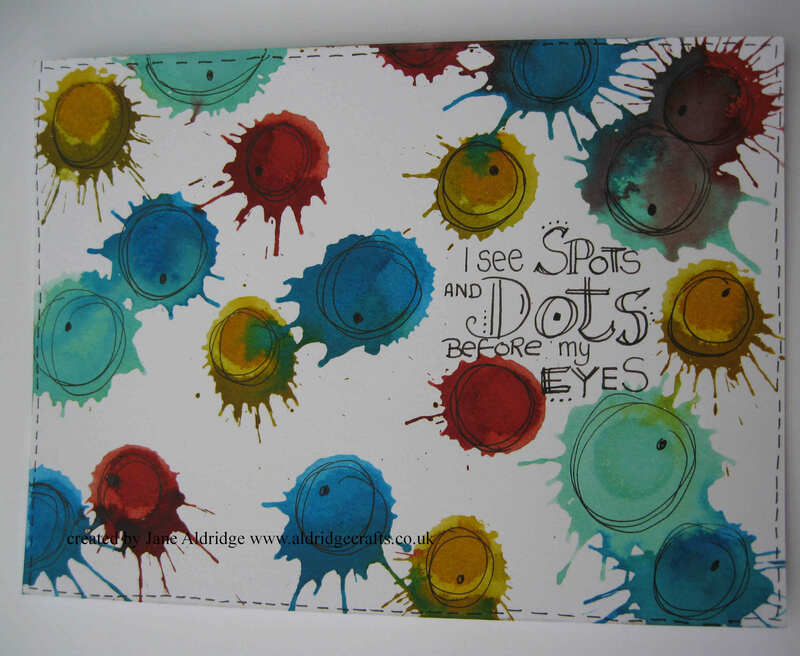 Take your Distress Stain and get them flowing well on your craft mat and then using a bit of speed and pressure, splodge them down onto your card to get these fab splats. Its a great technique to use to create kids cards too. I then just doodled in each of the splats with a fineliner and added the words. 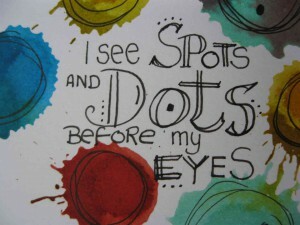 Don’t be afraid to have a go at putting on your own wording onto your artwork. If you see my handwriting – it’s like an injured spider has limped across the page, but when I am doing lettering, I do a practice run on spare cardstock to work out how big a space I need and then just take it slowly when I write to get it as neat as I can. A little random letter spacing is all part of the fun. So that’s my challenge to you today – create something with your own lettering on – be brave – give it a try! 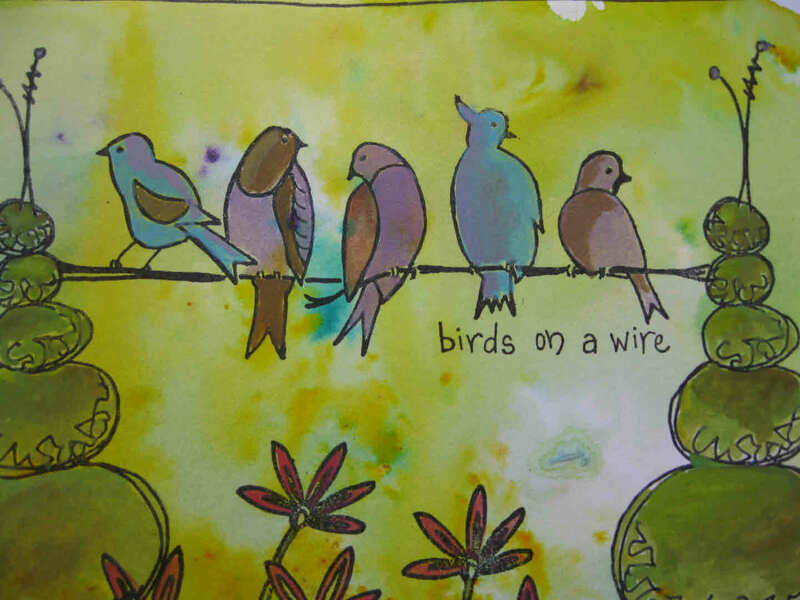 A fun little PaperArtsy playing piece today. I’ve had a delivery of new stamps – so they just have to be played with! 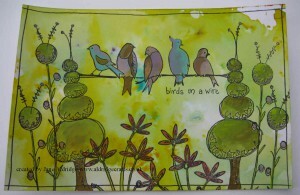 i thought it would be fun to combine the JOFY Topiary Trees along with the Squiggly Ink birds on a wire. The background is Brusho, as is the painted in detail too. Loving these trees, although they are known at the space alien trees in the shop because I think the tall skinny ones look like an alien with antennae!.. watch this space for an alien piece at some point haha! I painted the birds in brighter colours to make them stand out a little more. 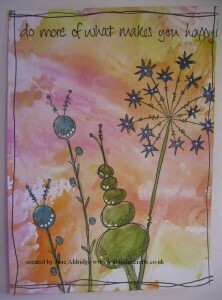 Sometimes its nice just to play and experiment with your stamps! Don’t forget the next Inky Addicts club is on Sunday 9th August at Garnier hall in Eccles – reserve your seat now! Our shop is in Attleborough Norfolk. Suva House, Queens Square, Attelborough, Norfolk NR17 2AE 01953 454976 I live in Norfolk with my husband Pete, Molly the dog and Finlay the cat and have always been a crafter. I started papercrafting in 2003 and love rubber stamping, experimenting with inks and other mediums as well as the traditional decoupage and am now also hooked on jewellery and beading! I started up a mobile shop and on-line crafting supplies shop in March 2007. In March 2012 we opened our high street shop in Attleborough. I run local monthly crafting groups and regular workshops. I also sell my handmade jewellery and cards and some beading supplies via my Folksy shop.